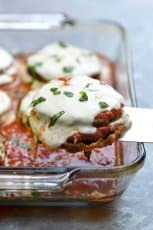 A substantial appetizer brimming with beef, beans, enchilada sauce, and of course, cheese! I made this beefy, cheesy, deliciously messy dip today and I also happen to be in a weird mood. Don’t say I didn’t warn you. I’ve been catching myself saying “totally” a whole lot lately. I think now that my boys have grown, I’m reverting back to my 80’s valley girl days when Valspeak was a true way of life. So what if it was Silicon Valley and not San Fernando Valley – oh…mah…gawd, you guys, it’s still like totally a valley. When confronted with anything we considered to be grody, my Silicon Valley gang of girls and I frequently dropped terms like “gag me with a spoon” which eventually evolved into the more simplified but equally expressive “ugh, gag me”. “Totally to the max” escaped my lips approximately 500 times a day and pretty much every sentence began with “Like”. I think it’s time for a remake of the Nicholas Cage classic but this time around it’s called “Silicon Valley Girl”. No? Come on! Okay, got that out of my system. 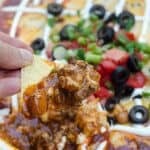 Shall we talk about Beef Enchilada Dip? Lets! This is no wimpy appetizer. As a matter of fact, it’s so substantial I could easily call it a meal. It’s manly, man food that this girly, girl thinks is ALL THAT! Make it for Cinco de Mayo. Make it for the next NBA playoff game (GO Warriors!!!). Or just make it for the heck of it. 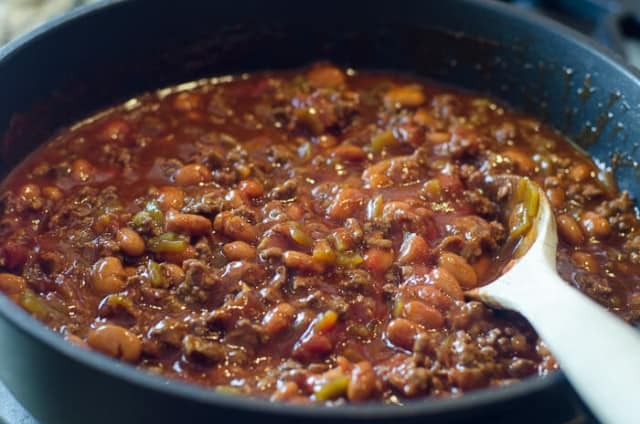 Cook a pound of ground beef in a large skillet over medium heat, breaking it up with a spoon as it cooks. Drain off the grease and return the pan to the stove over low heat. 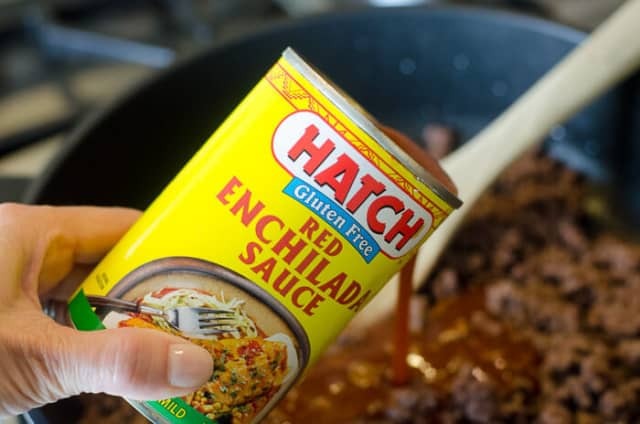 Add a small can of mild red enchilada sauce. Hatch makes a really good one and I also like Las Palmas brand. Not pictured but also added – an 8 ounce can of tomato sauce. 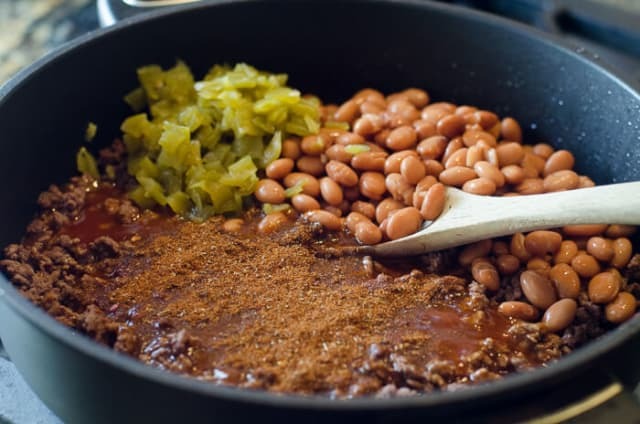 Into the skillet goes a can of pinto beans that have been rinsed and drained, a can of diced green chiles, and 2 teaspoons of taco seasoning. I highly recommend using Homemade Taco Seasoning Mix in recipes like this one but the packaged, store-bought variety will work in a pinch. You could totally (sorry) use black beans in place of the pinto beans if you’d like. Add 1 cup of shredded cheese. I used 1/2 cup each of sharp cheddar and Monterey Jack. Combine and remove the pan from the heat. 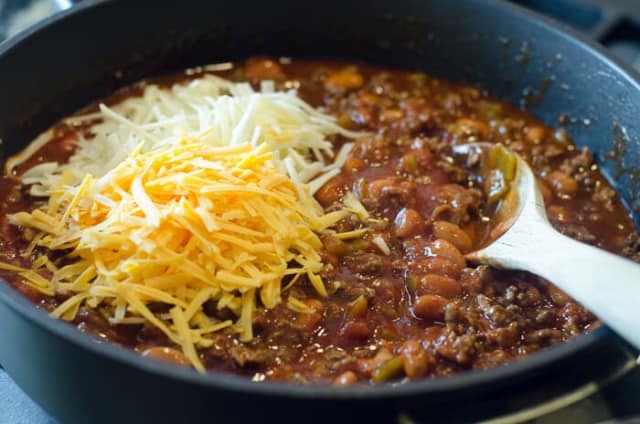 Pour the mixture into a baking dish and sprinkle with an additional cup of shredded cheese. Pop that sucker in a preheated 375 degree oven for 15 to 20 minutes, or till hot and bubbly. 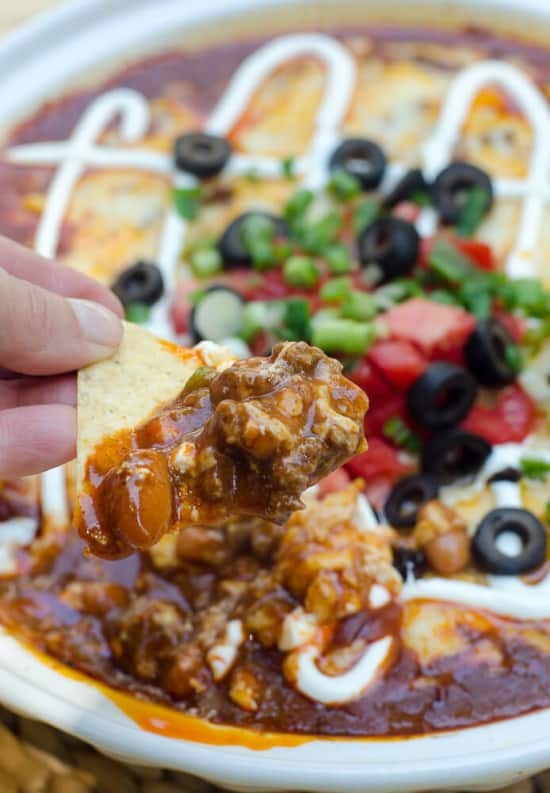 Remove the hot, bubbly dip from the oven and let it sit for about 5 minutes to settle and calm it’s delicious self down a little before adding the toppings. 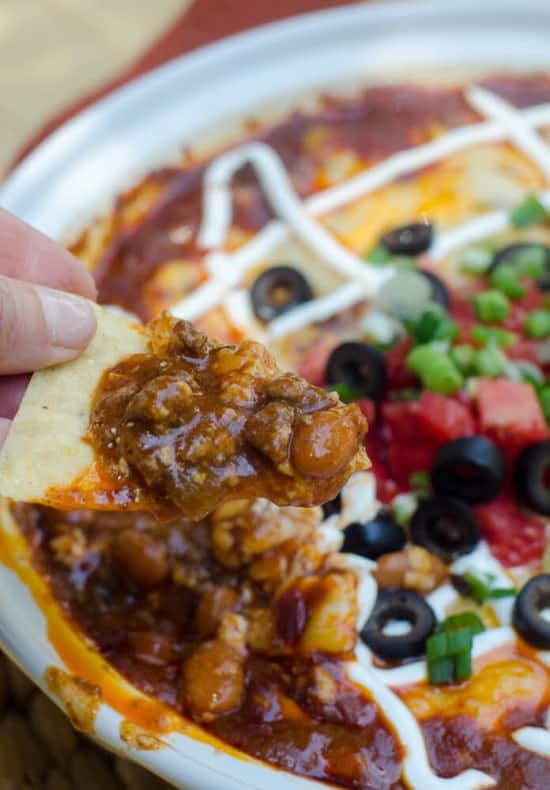 Serve the dip with sturdy tortilla chips or Frito’s Scoops. All that’s left to do is dig in! 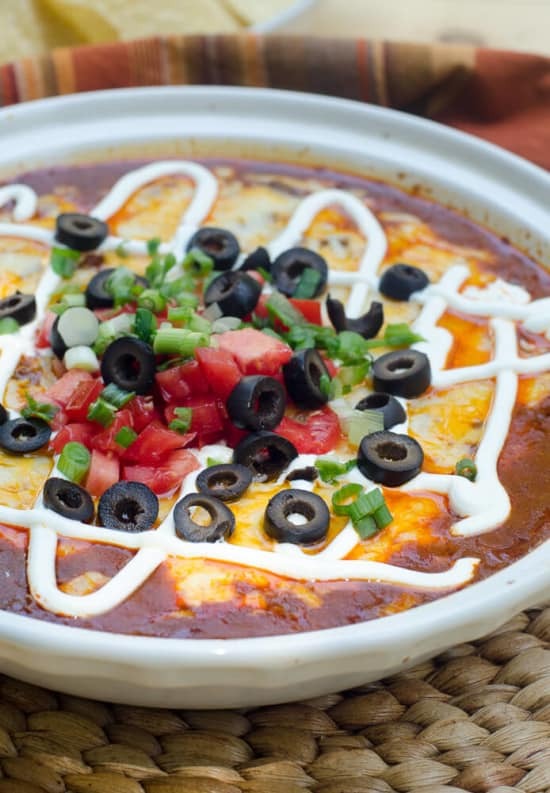 A hearty Mexican-inspired dip brimming with beef, beans, and enchilada sauce. 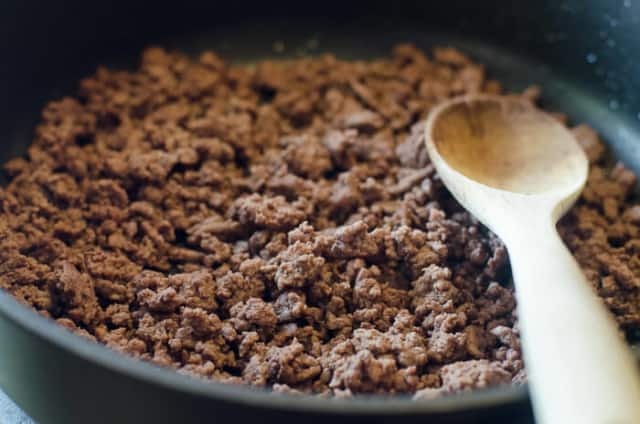 Brown ground beef in a large skillet over medium heat. Cook and stir until crumbled and no pink remains. Drain the grease from the pan and return to low heat. Add enchilada sauce, tomato sauce, taco seasoning, beans, and green chiles. Stir to combine. Stir in 1 cup of the shredded cheese and remove pan from the heat. 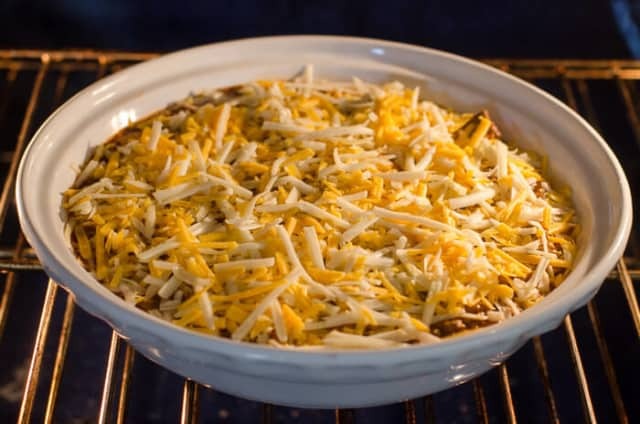 Pour mixture into a baking dish and top with remaining cheese. Bake for 15 minutes, or until cheese is melted and bubbly. Remove from oven and allow it to cool for about 5 minutes. Add toppings of choice - olives, chopped green onion, diced tomato, chopped cilantro. Drizzle with sour cream. Serve with tortilla chips or corn chips. Make-Ahead Instructions: Follow as directed but after transferring the mixture to the baking dish, cover the dish with plastic wrap and refrigerate. 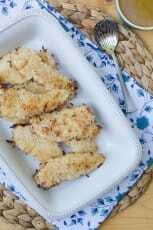 When ready to bake, remove from refrigerator and allow to sit out for 15 to 20 minutes and then top with cheese and bake as directed. Cooking time will be longer if cold when going in the oven. 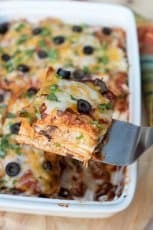 Ya know what I love about enchiladas? 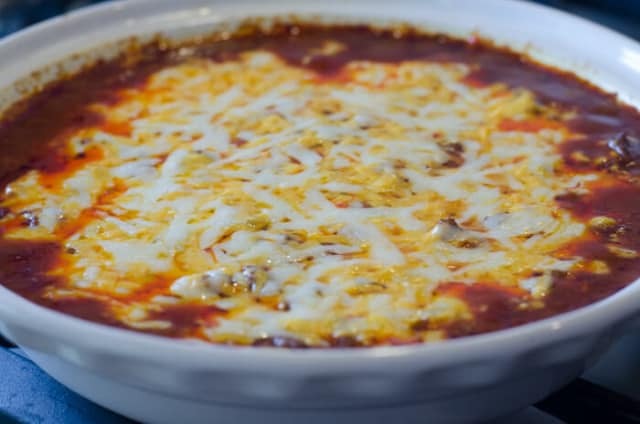 That sauce with the layer of cheeeeeese floating on it that surrounds the enchilada. Sometimes, I just forget about the enchilada for a little bit, and scoop that sauce n’ cheeeeeese up with a chip, and slurp that down like it’s a Bluepoint oyster. 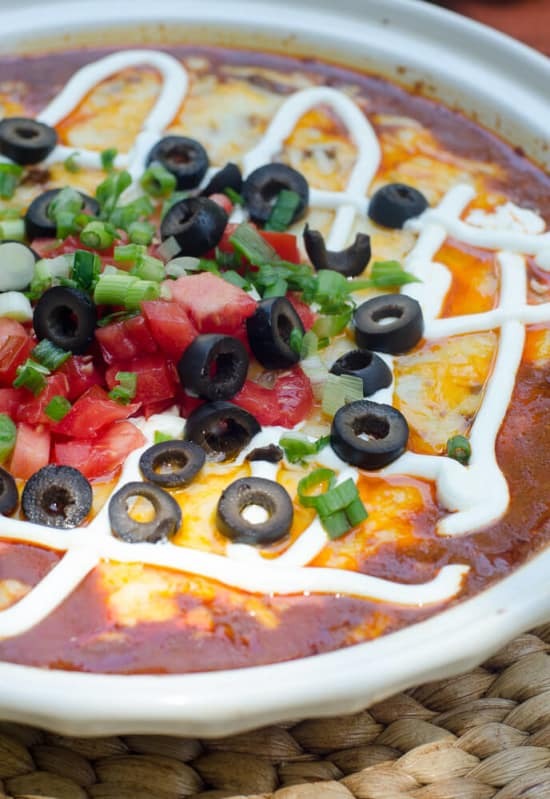 So, here you’ve made a DIP out of it, with all the essential enchilada-ness ensconced therein! I like your recipes, but don’t see where I can share to F.B. for friends ?? This would be nice to do. 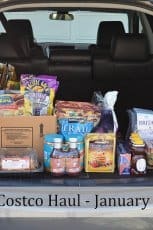 When I really like something I am a sharing person..Thank you!